Fourth-year Luke Tsai powerfully hits a forehand towards his opponent. The University of Chicago men’s tennis team dominated as hosts of this weekend’s regional round of the NCAA tournament. Coming into the tournament, the Maroons were rolling, having won all three of their matches at the UAA Championship including an upset of No. 2 Emory University. The NCAA championship was supposed to be played outdoors, but the fickle Chicago weather drove the tennis indoors to the XS Tennis Village. During Saturday’s play, the Maroons drew Augustana College, which defeated John Carroll College 5–2 on Friday. The Maroons made swift work of the Vikings, only dropping one doubles match in a 5–1 victory. Chicago went up 2–1 after doubles play by taking No. 2 and No. 3 doubles. Then, during singles play, third-year Charlie Pei made quick work of his opponent 6–0, 6–1. Pei was quickly followed by fourth-year David Liu at No. 5 singles who won 6–0, 6–3. Then, fourth-year Luke Tsai closed out the match with a 6–0, 6–3 win at No. 3 singles. 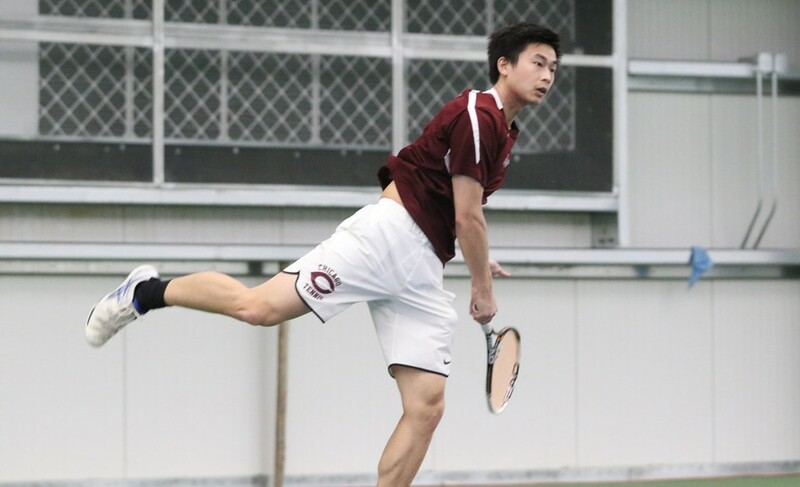 On Sunday, the clouds parted and the rains stopped as the Maroons shifted outside to the Stagg tennis court to take on UAA foe Carnegie Mellon. This was the third time this season that Chicago squared off against the Tartans. Going into the match, UChicago knew this would be one of its toughest thus far. The No. 9 Tartans were looking to ruin a historic season for the Maroons and came out firing. Carnegie quickly controlled No. 2 doubles, but fourth-years Nicolas Chua and Liu dominated at No. 3 doubles 8–3. That left a hotly contested No. 1 doubles match. Coming off of a loss on Saturday against Augustana, the team of second-years Erik Kerrigan and Kumar quickly fell down 2–0 but came roaring back. The team of Kumar and Kerrigan went on to break Carnegie’s serve twice after being down 6–4 to rally for a massive 8–6 win. “Being down 4–6 was obviously not ideal for us, so we really were shocked when we went down early,” Kumar said. “Carnegie came out firing and we did our best to stay close. Having a lead going into singles is huge so I’m really happy we were able to win this match. The crowd really brought a lot of energy and it was great to have their support.” The crowd of students, fans, and other members of the tennis team echoed around Stagg courts as breaks of serves were happening left and right. UChicago fed on this home court advantage and carried the momentum from doubles play into singles. The singles matches all began very tight initially, including David Liu’s. However, the fourth-year steadied himself en route to a 6–4, 6–2 victory. Following Liu came Pei. Pei shook off a tough second set to win the third set handily 6–3, 1–6, 6–1. Finally, to close out the match again, Tsai won a grueling two sets 6–4, 6–1 to give Chicago the team victory. The Maroons will pack their bags and head for Claremont, California to take on the host Claremont-Mudd-Scripps in the quarterfinals of the NCAA DIII Team Championship.